Choosing a Caterer - Elizabethan Catering Services Ltd. Your decision on which company to hire will depend on many things: Your budget, your “Comfort Zone” with a particular company, and the type of catering that you are planning. All of our sales team encourages you to shop around at our competition, because we are sure that you will find us such a wonderful company to deal with, and hope that you feel that you are receiving the very best value for your money. The first thing that you have to do, before considering anything else, including budget, is to imagine how you would like your event to unfold. Close your eyes if you have to, and you will be able to see, in your mind exactly the type of layout, and location, that you are trying to achieve. From then on, you can proceed with specifics and know, pretty much, what to ask for. “I’m not sure” at this stage, is a bad situation to be in, as it is difficult for a catering professional to help you. Get the picture in your head, before you go out and ask questions. Catering covers such a huge scope, that without a picture in your mind, you are asking for trouble. Start calling some caterers, and measure their response, very carefully. Start writing responses down, as in a few weeks you will never be able to remember exact points, when they were called, whether they said they would send or fax something to you etc. This will become even more important if you start calling a wide selection of companies. Don’t talk price right way. That is important. There are many things that can affect price of the event, and you need to get to specifics first. 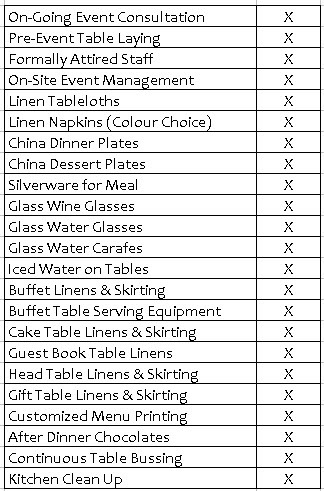 Remember, Caterers are not all equal. Make sure you are comparing apples to apples. Do not choose a caterer on price alone but on the value they are providing for the price. If you do choose a low price, you will be running all over town for rentals, and remember there is no such things as cheap, good food! Don’t be fooled by the appearances of a bargain when it comes to professionally catered events – just what are you getting? 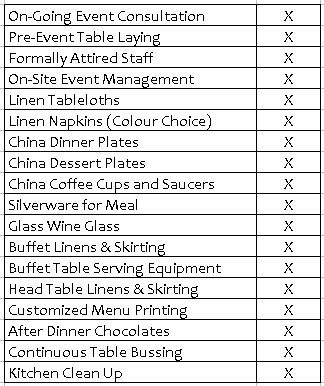 You may be surprised to find that other caterers quote on just the food portion; “expected” touches like china, glassware, linens, and the like all come as additional charges to the bottom line. All said, the deal is suddenly not so anymore! We pride ourselves on a no-nonsense approach and provide you a simple total that includes everything that makes a formal catering affair truly elegant. Truthfully, comparing items side-by-side like this affirms our approach, one we have stayed with since 1985!